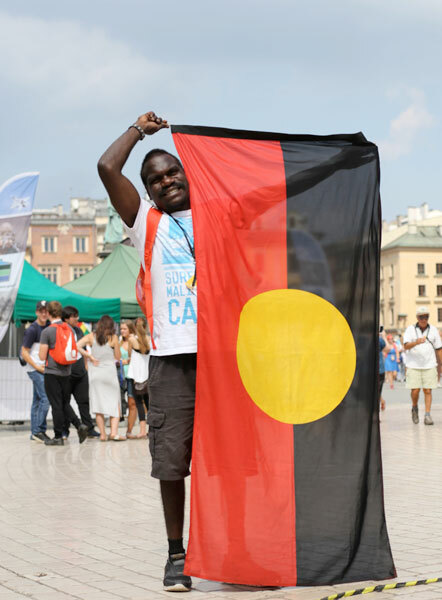 INDIGENOUS Catholic Bon Gerard Timaepatua never heard the word mercy until the World Youth Day in Poland. 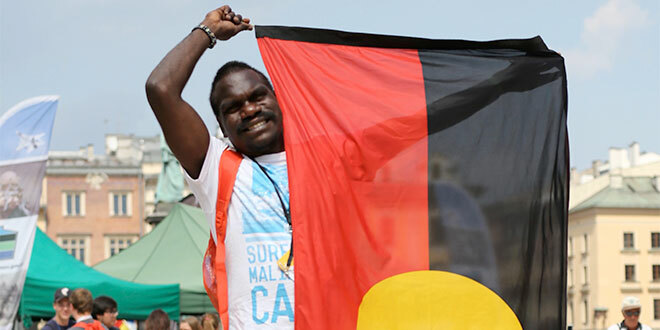 Hailing from the Tiwi Islands, about 100km north of Darwin, Mr Timaepatua has spent the past three weeks on pilgrimage with a group of young people from the Northern Territory, Rockhampton and Brisbane. He has walked through the streets of Poland and more recently Krakow, affectionately known as the city of mercy, learning exactly what the term means. “Like for me it’s my first time hearing Divine mercy and mercy,” he said. Hearing about mercy everyday during the WYD has made a profound impact on the St Therese’s, Wurrumiyanga, parishioner. “I think it made me change my life,” he said. Mr Timaepatua has made a resolve to go to daily Mass and stay committed to stop drinking alcohol, a decision he made when he returned to the Catholic faith eight months ago. “All my life I didn’t believe in Jesus, but my nana told me, you have to believe in Jesus,” he said. Mercy and God’s grace have also produced a family miracle for the Timaepatua’s back home in the Northern Territory. His brother was admitted to intensive care after falling ill.
“My brother got very sick and I wanted to go (home) but my mum and dad told me to stay here (in Poland) and they said to me, stay there, just pray to God,” Mr Timaepatua said. He prayed before the relic of St John Paul II, and the group’s chaplain priests offered up a Mass for his brother. “Then my mum called last week, Monday I think she called … and she said my brother is better now and it was exciting,” Mr Timaepatua said. He also believes his pilgrimage to Poland is a miracle. “I’m not in Australia, I’m in Poland,” he said. “It’s my first time overseas. “For me, I didn’t want to come to WYD but (Missionary of the Sacred Heart) Fr Pat Mara, our chaplain, he told me to come with him because I always go to Church every Sunday and Thursday. “I said to myself – what am I going to do? “I’ll go to WYD while it’s there. “I’ll try and see what it’s like in Poland. “It’s my second WYD and I’ve met all of the people here too as well.